Another midweek, another match for Saints, this time in the league. Stoke on a cold Wednesday night- maybe we’ll never know if Messi can do it, but we’ll find out about Saints here. Shaqiri’s through pass gives Allen a chance to shoot low at goal early on, but Forster improves that save percentage of his with a block with his feet. At the other end Boufal looks lively from the start, first winning the ball on the edge of the Stoke box and making space for a shot that is easily saved, then making a nice pass to put Long in for a shot wide from an angle. It’s a bright opening 20 minutes for Saints, although we don’t manage to create much more than half chances and get frustrated by a couple of incidents where ref Anthony Taylor allows Stoke to get away with what appear clear fouls. But on 23 minutes it’s the Stoke fans that get annoyed by Taylor as Arnautovic goes in studs first on Boufal’s knee and is shown a straight red card. It’s the kind of thing that you sometimes miss when in the crowd because Arnautovic stayed on his feet rather than diving in, but the replays show that it was a nasty challenge, fully deserving of the red card and it gives Saints a potentially key advantage early in the game. Van Dijk is unable to get on the end of the whipped in free kick, then in midfield Allen mis-controls the ball making Romeu think he can nick it away from him, but he can’t quite get there and picks up a yellow himself as he clatters into Allen. Allen himself gets a yellow for repaying the favour on Romeu a few minutes later to give Ward-Prowse a sight of goal from nearly 30 yards but Grant in the Stoke goal gets behind his free kick. Then Long is a bit lucky that a clash with Martins-Indi goes unnoticed that leaves the Stoke man needing to leave the pitch for treatment, although I didn’t get a decent replay to judge myself, I read that there was apparently a sly elbow in the ribs. And look at this, we’re at half time and nearly all of this report has been taken up with comments about dirty play- and to be fair on Stoke, Saints are not behaving like angels themselves. Precious little goalmouth action, although Saints have had a lot of the ball and most of the game has been played in the Stoke half. With the man advantage, if Saints are able to step things up then it’s an opportunity to take 3 points. Saints start the 2nd half like they do mean business, a tricky set of exchanged passes ends with Ward-Prowse tripped right on the edge of the box as he looks to burst through, but van Dijk shows that his talents do not extend to free kicks as he hits it into the wall (it did hit Adam’s arm but clearly no intent there). The pressure continues from Saints, Grant scrambling to stop a low cross then Pieters heading away from under his own crossbar and Davis shooting over from distance. Shaqiri punches the dugout as he gets substituted, his withdrawal underlining Stoke’s revised intent in the match. Boufal has a good effort from distance, then Bertrand’s powerful shot forces the best save of the game so far from Grant. Still, it’s difficult for Saints to get behind Stoke’s packed defence or get a really clear sight from closer range. A double change sees Rodriguez and Tadić come on in an effort to inspire that cutting edge. The replaced men are Redmond, who has done OK in flashes but not looked amongst our most likely candidates to create something, and Long who has struggled yet again - it’s not his season so far. The changes almost bring an immediate reward as Davis feeds Boufal, who bursts into the area - he might shoot himself, but looks for Rodriguez at the back post sliding in, but he can’t quite reach it. Unlucky, or a symptom of his lack of sharpness which he still hasn’t regained on his return from injury? Difficult to say, but every missed chance like this adds to the feeling that he might not rediscover his true self, poor guy. Minutes later a Saints break from a Stoke corner ends with Davis crossing to Rodriguez who again can’t reach it at the back post, although this one looks less glaring for the striker. As the clock ticks down, Stoke dig in even more and look pretty comfortable as they aim to claim their point. The likes of Tadić and Boufal try their best to tease the Stoke defenders and make something happen, but there are too many dead ends for Saints tonight. 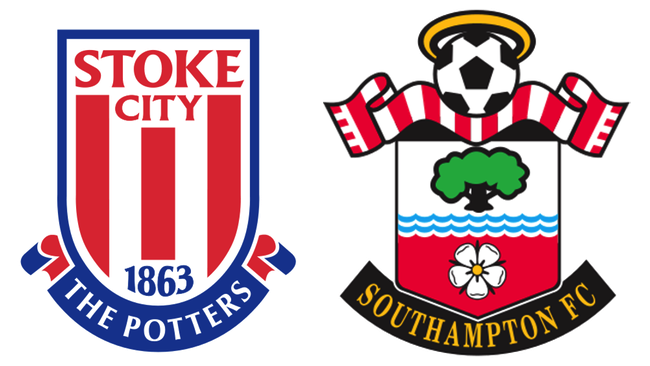 The game fizzles out frustratingly for Saints, a job well done for Stoke who adjusted well to playing with 10 men for such a long time. Saints were the better side before the sending off and completely dominant after it, but despite a few decent moments never really looked convincing in our efforts to unpick the lock. Stoke defended resolutely and made things very difficult for us, but it’s a theme of the Puel league season, that we struggle to break teams down. Essentially 70 minutes of attack vs defence, it’s fair to expect more clear chances to be created I think and 14 goals from 16 games tells its own story. There are caveats for the first half of the season with such a demanding schedule, but Saints need to find more fluency in attack in future and it’s Puel’s job to instigate that.